This is soup weather. We've been enjoying at least one soup a week for the last month or so, and this week is no different. You see, our pre-trick-or-treating tradition is to fuel up on Chicken Fiesta Soup. The whole family loves it and I figure the beans, vegetables and lean protein provide the perfect foil to the candy and sugar overload that follows. But a new soup contender for "favorite soup" has entered the Sweet Pea home. 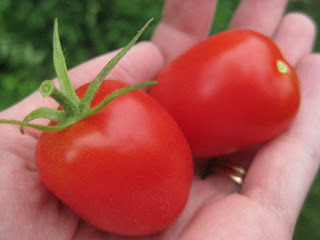 Again, in an attempt to use the gobs of tomatoes from our garden, I created a soup recipe I endearingly call "Pizza Soup." 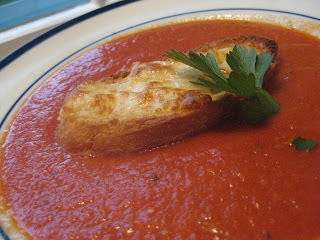 I could have called it Tomato Soup with Cheese Croutons, but my guess is that R and G wouldn't have been quite as excited about such a soup. Suffice it to say, if the word "pizza" is in the dinner menu title, they are excited. 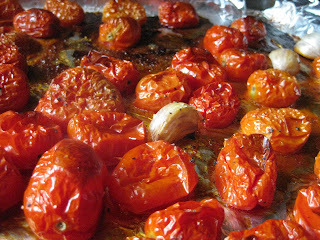 Pour the roasted tomatoes into a medium sauce pan over medium-high heat. Add the garlic, basil, oregano, black pepper and chicken broth and cook for about 4-5 minutes. Taste to see if the soup needs any extra salt and pepper and season if need be. Return the soup back to the sauce pan over low heat to keep warm. Preheat your oven broiler. 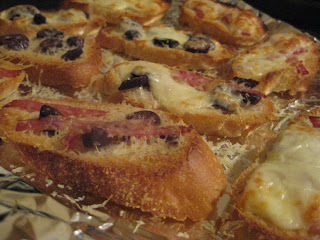 Place the french bread on a cookie sheet and top with cheese and olive, peppers and pepperoni, if using. Broil for 2-3 minutes or until the cheese is melted. To serve, place soup in the bottom of the bowl and top with 1-2 pieces of bread. I talk to myself a lot. 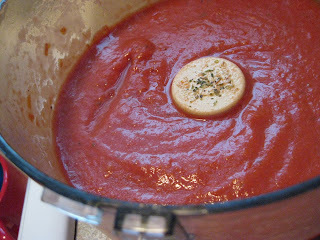 And I was scrolling through my reader and saw Pizza Soup and I said out loud, "Oh my gosh, she's a freaking genius". You are. What a brilliant idea, especially calling it pizza soup so that your boys are more apt to eating it. And BTW, we as well will be having that chicken fiesta soup on Halloween night. I just bought the ingredients at the store this afternoon. Think of us as you are eating dinner before heading out the door for trick or treating! Aww...you are too sweet. We'll think of you for sure as we are gobbling up our soup! oh ho! I have new meals for the roster! It SO is soup season! That is great recipe. My boys will anything if you call it pizza. Oh Yum!! Love that it's still rich and creamy without the cream. Love that it's rich and creamy without the cream.